This is a past edition page... ...go to GeoIT Talks overview page for upcoming edition. MotionTags initial idea was to create an intelligent location analytics tool for infrastructure providers. Through advanced smartphone sensor analytics and machine learning, we can identify how, when and where a user is traveling. By using our products clients could learn from the mobility of their users while we could improve our technology. But why stop here when this could improve the lives of numerous people? We have used the acquired learnings to develop our vision: creating a seamless pay-as-you-go ticketing solution. Traveling should be seamless and should not be stressful as it can be nowadays. We are currently piloting our ticketing solution that will enable public transport to compete in the future with new mobility offerings. We think the future of transportation lies in easy traveling, achieved by seamlessly combining different transport modes. Further information: https://motion-tag.com/. Lüders, Ruppel - 2018 - Macroscopic Patterns in Sparse Location Data Identifying Mobility Prototypes Ubiquitous computing and location-based services are key enablers for gaining novel insights into human movement behavior on a large scale. When searching for patterns in movement behavior, several approaches have been proposed to compare location trajectories or semantic overlaps. This talk and paper introduces the notion of mobility prototypes, which describe human mobility behavior at a macroscopic level and express its most significant characteristics. 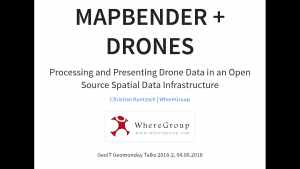 Based on a dataset of coarse spatiotemporal data from almost 4000 mobile users of a locationbased service over a period of 14 days, we outline a comprehensive and systematic pipeline for processing and exploiting mobility traces and provide insights into the mobility behavior in the city of Berlin. We present a framework to characterize individual users precisely by employing a novel combination of discriminative features capturing the macroscopic mobility behavior, without revealing their identity or actual whereabouts, and define mobility prototypes by constructing clusters of users. The results yield valuable insights into the variety of human mobility and open up new possibilities for future mobile services.